Home » Science & Technology » How many undiscovered creatures are there in the ocean? “The oceans cover 70% of the surface of our planet, and yet they are still the least explored,” says Sir David Attenborough in the opening sequence of the recent BBC documentary series Blue Planet II. “Hidden beneath the waves, there are creatures beyond our imagination.” Yet while the programme reveals the wonders of many of these species, an incredible number more have never been encountered by humans at all. In fact, we don’t even know how many species exist in the oceans. Most estimates were made before we even had any inventory of how many had been scientifically named – they have ranged from 0.3m to an astounding 100m. Numerous new marine species are discovered every year – yet working out how many species there are in total (and so how many more we need to describe) is a much more difficult process. But now we at least have the essential foundation of knowing how many marine species have been named, thanks to a decade-long collaborative effort by hundreds of scientists. 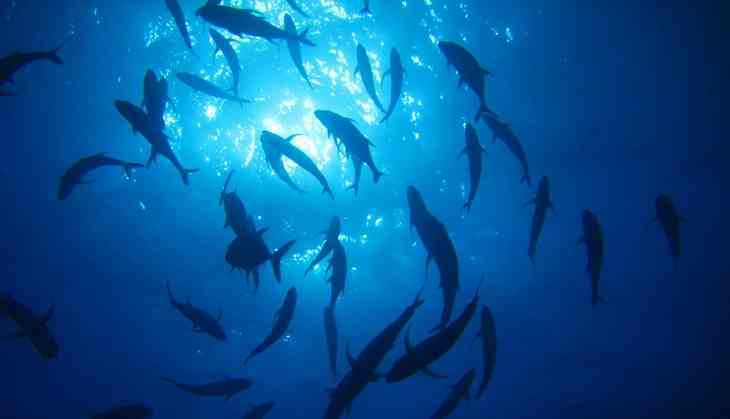 Scientists have used a variety of methods to estimate the global number of marine species and each has its limitations. Data isn’t always reliable and the assumptions of each method can be flawed. A common method is to scale up the fraction of unknown species estimated in a specific sample or region. Other methods rely on our system of taxonomic classification (the way we name and group different species). We can use the rate of discovery of new families and orders or the rate at which new species are described to estimate the total number of species there must be. Some methods have used expert opinion on how many unknown species are expected in a particular group the expert works on, based on potential new species that they know of but haven’t yet been described. According to a study from 2012, the average time between the discovery of a new species and its description is 21 years. Because each method relies on assumptions and particular datasets, they have resulted in wide variations in estimates. The very high estimates (any larger than 10m) are now thought unlikely by many, but current common estimates still vary between around 0.3m and 2m marine species. This means that, after 250 years of describing, naming and cataloguing the species we share our planet with, we are still a long way off achieving a complete census. But we do know that 242,500 marine species have been described because their names are now managed in the World Register of Marine Species (WoRMS) by about 300 scientists located all over the world. Every year, almost 2,000 marine species new to science are added to the register. This includes species from relatively well known groups such as fish, almost 1,500 of which were described in the past decade. Most undiscovered creatures likely remain in the least explored habitats such as the deep oceans, the most diverse environments such as tropical shallow seas, and the most diverse groups including molluscs and crustaceans. Most of these species are probably “macro” sized (1 mm to 10 cm) seabed-living crustaceans, molluscs and worms. We’ve found just over 6,000 new marine crustaceans and almost 8,000 marine molluscs in the past ten years. A recent finding of 28 new amphipod crustacean species doubled the number of them known in Antarctic waters. Taxonomists are busy collecting, identifying and describing new species of marine animals all the time. The process from collection of a sample to the publication of a species as new to science is arduous and time-consuming. All characteristics of the animal need to be carefully examined and compared with every other closely related species. This now often requires DNA analysis which provides additional data for later researchers to be able to identify the new species by its genetic “barcode”. Once the data from a new species has been published in a scientific journal, the WoRMS taxonomic editor responsible for that group of species enters the information and makes it openly available to all users worldwide. Since the WoRMS was founded in 2007, the number of species on the list has doubled from 120,000 to 242,500. The number of names in the database is actually almost double this figure (477,700) but many of them are not valid because of duplication or changes to species classification. Keeping an up-to-date list of the world’s marine species isn’t just for interest but is also important for protecting our oceans. Extinctions from habitat loss and climate change are progressing at alarming rates. Around 20% of marine species are at risk of extinction and we urgently need to document what is happening in order to better understand why and how to prevent it. Biodiversity also underpins many features of the environment that humans depend on. Each new species discovered could provide opportunities for advances in medicine or agriculture. WoRMS has brought us closer to a complete assessment of our marine biodiversity than ever before. Perhaps this model of real-time online collaboration between experts around the world – and a centralised database with a professional data centre – could be used to provide a continuously updated, freely available, comprehensive database of all species on Earth. Until then, we will continue to marvel at how much we still don’t know.